Abstract : We present SLAPbook, an application using SLAP, translucent and tangible widgets for use on vision-based multi-touch tabletops in Single Display Groupware (SDG) environments. SLAP stands for Silicone ILluminated Active Peripherals and includes widgets such as sliders, knobs, keyboards, and buttons. 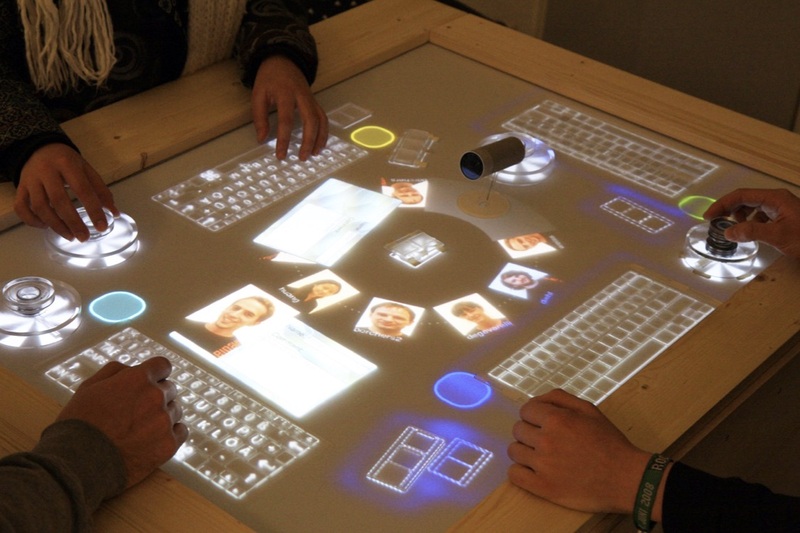 The widgets add tactile feedback to multi-touch tables while simultaneously providing dynamic relabeling to tangible objects using the table's rear projection. SLAPbook provides multiple users the ability to add and edit content to a guestbook, browse other peoples' entries, and access personal data using a token-based personalization system. Interaction with the table takes place in the personal and public space so that users can make use of personal and shared controls to perform separate and coordinative actions.